LA County's only Recreation Vehicle campground ON THE BEACH. RVers enjoy sunshine, ocean breezes and a scenic panorama from Malibu to Catalina Island. 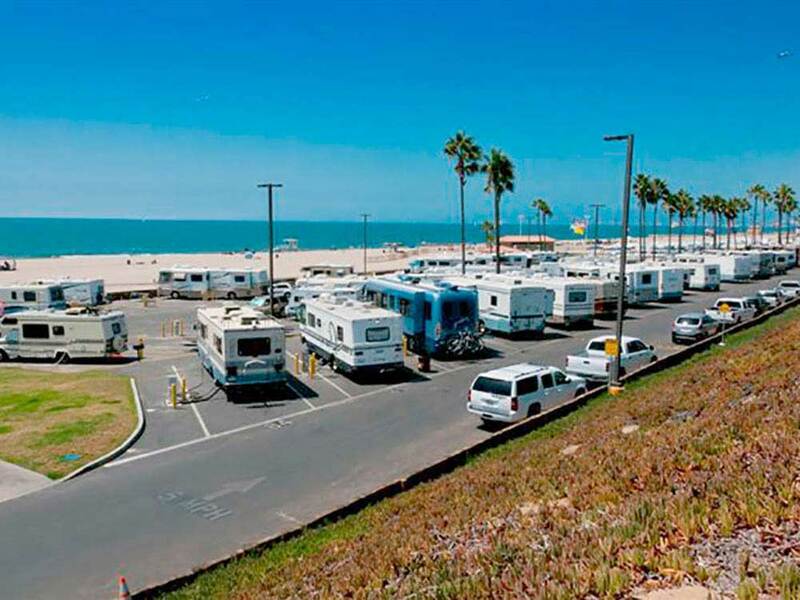 There's plenty to do and lots to enjoy at Dockweiler RV Park. You can't beat this RV park for location. It's on the beach, and a short drive to a ton of bars and restaurants. It's also driving distance to any of the usual LA attractions. Yes, the sites are small (it's basically a parking lot for RVs). But it's SoCal, so space is at a premium. And the price, while higher for an RV park ($65-70/night), is reasonable when considering that hotels in the area could easily cost 2-3x that amount. Also, wrap your mind around the fact that it's near the airport so you'll hear planes. Some noise should be expected since you're essentially staying in a city. There are full hookups, showers, and bathrooms (note: the ones on each end have an access code and are far nicer than the middle ones). Each site has a picnic table and charcoal grill. There's also a biking/walking/running path along the ocean. Book early. This place fills up quickly. We were surprised how nice this place was. The spaces were fairly narrow but I was able to extend the slides and park the Jeep on the site also. Had all the hook ups needed. It is fairly close to the end of the LAX runway but the noise from the planes was not bad at all. Bring your bikes as there is a great bike path along the beach. Also, when booking your site on their webpage you want to understand that the sites are pull in and back out for motorhomes. I had never experienced that before. So the best motorhome sites are at the south end on the beach side as you pull straight in so your windshield it facing the ocean.. The park was niceexcept for the airplane traffic but that is out of the control of the park. Sites are plenty spacious for pop outs. Park is kept very clean. My one complaint is that they do not allow motorhomes and trailers to park on the front row together. Some of my family have coaches and others have trailers so if we all wanted front beach row spaces we would have to camp in two different sections of the park. From Jct of I-405 & I-105, W 2.5 mi on I-105 to end of Fwy-becoming Imperial Hwy, continue W 1.9 mi on Imperial Hwy to Vista del Mar (Entrance to RV park at state beach entrance).